If you’re visiting a country for the first time, it’s always a good idea to brush up on local customs so you don’t end up offending locals during your trip. FailPop for iOS is here to rescue you, with helpful tips for several destinations, as well as illustrative GIFs. Let the app know where you’re headed and it’ll show you handy hints for meeting people, dressing appropriately and dining. Each tip is accompanied by a GIF and can be shared on social networks. 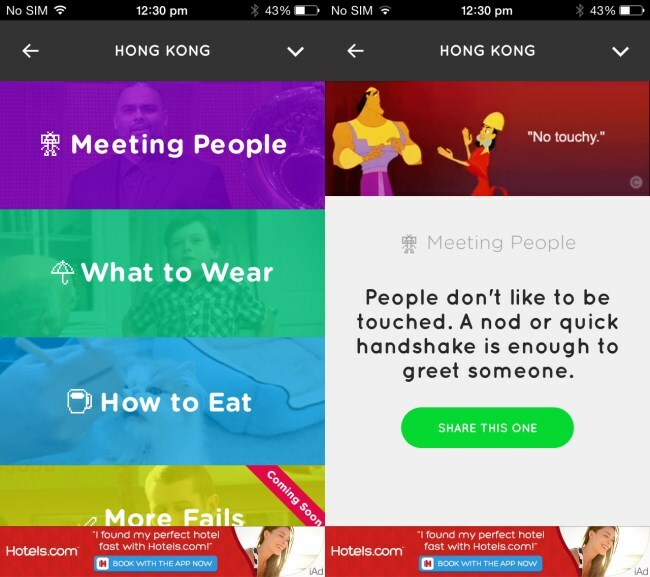 I’m gearing up for a trip to Hong Kong soon, so I was glad that FailPop alterted me that people there don’t care for close contact — or for diners flipping fish over at a meal. The app currently offers more than 100 tips, with more being added manually by the team from sites and users’ suggestions. While FailPop has the potential to be a useful tool for frequent travelers, it doesn’t yet have enough content to keep you out of trouble in every situation. The app only offers up one tip for each interaction, and user submissions need to be manually approved. Having said that, FailPop looks promising and I’m going to keep it on my home screen a while longer to prevent awkward faux pas the next time I travel.